I was 16 years old, and had just arrived in the USA. John asked me my favorite sport. I replied, “football.” When I learned that he also loved “football,” we launched into an animated conversation that became quite confusing. Only when I remembered that the word “football” in the USA was used for a sport where a funny-looking ball is carried by hand and seldom kicked, and that most Americans referred to what I called “football” as “soccer,” were we able to carry on a meaningful conversation where we actually understood what our conversation partner was talking about. 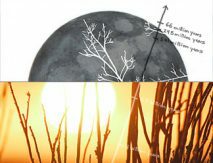 A global conversation about “witches” and “witchcraft” easily becomes every bit as confusing, and for the same reason. Different people use the same words to talk about fundamentally different and even unrelated realities. For example, in America and Europe there are new forms of religion (Wicca, Neopaganism) whose adherents publically identify themselves as “witches.” These “witches” typically adhere to feminist and ecological values and to the ethic of “first do no harm.” Such “witches” occasionally write a letter to the editor of an African newspaper, asking why local governments do not fully protect the rights of “witches” to practice their craft as they wish. Such letters assume a fixed meaning for the term witch and misconstrue the meaning of the term as it is used in most of Africa. Like John and me talking “football,” we use the same word, but unknowingly talk about completely different realities. Of course historically most of the world did not speak English. So this should not be primarily a discussion about the “true meaning” of the English word “witch” or “sorcerer/sorceress”. And yet anthropologists discovered across hundreds of languages and cultures a widespread (although not universal) lexically distinguished idea, the idea that misfortunes and deaths were caused by malicious human third parties making socially disapproved use of occult/supernatural power to harm or kill others. In some cultures there was a distinction between those who harmed others with innate psychic power, sometimes exercised unconsciously, and those who harmed others through power (consciously) exercised through the manipulation of learned magical techniques. 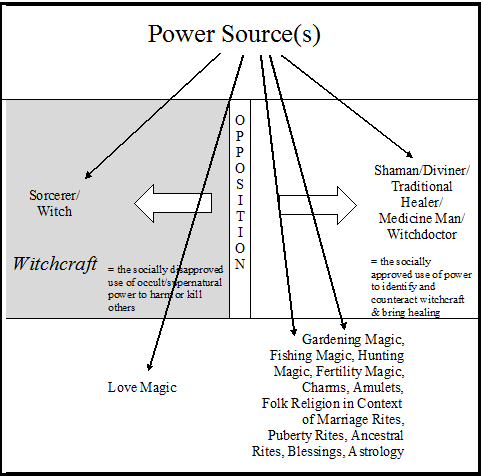 Following the lead of Evans-Pritchard, many anthropologists reserved the term “witch” to translate indigenous terms for those understood as using innate or psychic power to harm others, and the term “sorcerer/sorceress” for those understood as consciously using learned and acquired magical techniques to harm others. But since most cultures do not consistently maintain this distinction, it is common today for the term “witch” to be used by anthropologists for any person, male or female, believed to have caused the misfortune of others through psychic, magical, or other occult power. When the term “sorcerer/sorceress” is used, it often has a slightly more restricted focus and refers to people using learned and acquired magical technique to bring about harm to others. In societies that attribute misfortune and death to human parties identified as witches or sorcerers, there is often also another category of magico-religious practitioner who acts with social approval to combat the witch or sorcerer/sorceress. Indigenous terms for this other category of magico-religious practitioner have often been translated into English as “traditional healer,” “witchdoctor,” “diviner,” “shaman,” or “medicine man.” In most societies historically that had both “witches” (mchawi) and “witchdoctors” (mganga), the “witch” was thought of as acting towards anti-social ends — towards the harm of others, and the “witchdoctor” or “shaman” as acting towards pro-social ends — towards the healing of others. And, prior to the presence of Christianity, in most societies both the evil “witch” and the good “witchdoctor” were thought of as drawing from the same source(s) of power — which were neither intrinsically evil nor intrinsically good. That is, in most societies historically, while there was often a concept of a “high god,” there was not a Satan concept, a concept of a thoroughly evil non-human supernatural being opposed to God and the good — with all supernatural power thought to be either intrinsically good and from God, or evil and from Satan. Thus, prior to the influence of Christianity, moral judgment of the power being exercised was not normally based on whether the power was thought to come from God or Satan. Finally, it should be pointed out that in most cultures with both the figure of the “witch” and that of the “witchdoctor” set in opposition to each other, it was not only these two categories of person that were thought to exercise supernatural power. A wide range of other magico-religious practices were also carried out by a range of people who themselves were not identified either by the indigenous term for witch/sorcerer or by the indigenous term for witchdoctor/shaman. Gardening magic, fishing magic, hunting magic, fertility magic, the protective use of charms or amulets, ancestral rites and libations, marriage rites, puberty rites, love magic, the use of magic for entertainment purposes, or predictions about the future might be carried out by virtually anyone with the requisite knowledge, or by yet other named categories of practitioners with specialized power and knowledge. Figure 1 shows the common assumed pattern in many traditional societies prior to the influence of Christianity. Fig. 1: Traditional power sources in witcraft. Notice that the single agreed-upon locus of moral evil involved the image of the human witch/sorcerer. Here there is no image of a non-human supernatural Satan figure. Thus all sorts of magico-religious practices that were not associated with the witch or sorcerer were not thought of as necessarily evil, and their practitioners were not understood as intending harm to others. With the influential presence of Christianity came pressures for change in fundamental assumptions. Under Christian understandings it was often felt that any genuine supernatural power must be either of God, and thus good, or of Satan, and thus intrinsically anti-God and anti-good. The traditional image of the witch was easily understood as associated with Satan — since both were understood as evil. Indeed, since indigenous languages usually lacked words that closely fit the idea of Satan, it was often words associated with human witches or witchcraft that were used to translate the idea of Satan, as with the Adioukrou of Côte d’Ivoire, where the indigenous word for “witchcraft,” agn, is now used by Christians for “the devil.” Similarly, the anthropologist Birgit Meyer, in her book Translating the Devil (1999), documents how early missionaries to the Ewe of Ghana translated Satan as Abonsam, an Akan term which she says was originally understood by the Ewe as a synonym for “witch.” Every Ewe Christian reference to Satan thus becomes simultaneously a reference to, and ratification of, the witch idea. But whether or not words meaning “witch” were used to translate the idea of Satan, the associations between the two were easily and frequently made. And since traditionally the “witchdoctor” was thought to have the same power as that of the witch, if the witch’s power was of Satan, then so must the witchdoctor’s power be. And because “witchdoctors” were thought to have the same power as the witch even before the presence of Christianity, they were often suspected of secretly being witches themselves. That is, the image of the witchdoctor was often a somewhat ambiguous image to start with, which made the claim that witchdoctors were really deriving their power from Satan persuasive for many Christians. Furthermore, if all magico-religious power necessarily came from either God or Satan, then all traditional forms of magico-religious practice and power must be categorized as of Satan or of God. Perhaps the single best scholarly resource that describes in a contemporary context the transformations of older ideas about witchcraft and magic under the influence of Christian and especially Pentecostal and “third wave” ideas about spiritual warfare, is the recent book by Opoku Onyinah, Pentecostal Exorcism: Witchcraft and Demonology in Ghana (Deo Publishing, 2012). This ought to be essential reading for all of us wishing to think through these issues. Not only in Ghana, but in many societies that historically had the image of the witch and that have been influenced by Christianity, a reconfigured conceptualization of supernatural realities begins to look like this (figure 2). Fig. 2: Christianity reconfigures traditional witchcraft. Under such a reconfiguring, not only the traditional healer, but anyone who has poured out libations at a wedding or who has used a charm or amulet, is likely to be identified as practicing “witchcraft” — and may be suspected of what witches traditionally are thought to do, bringing harm and death to others. That is, a concept that originally constituted only a sub-set of traditional magico-religious practices, is now reframed as the master category for all such practices. Now anyone making any use of any traditional magico-religious practice, will be suspected of being a witch — someone who harms and kills others. This naturally involves a rather significant expansion of the meaning of the term witchcraft and of the number of people likely to be treated as witches. 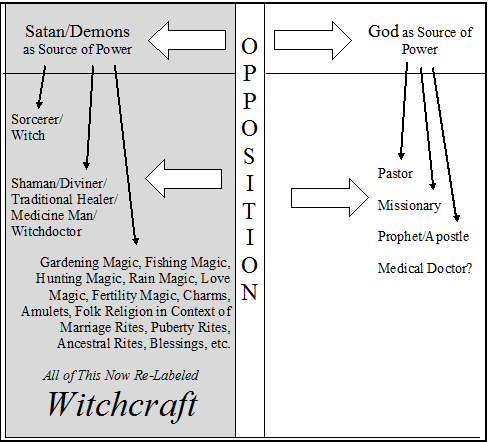 Furthermore, this new way of conceptualizing witchcraft encourages pastors or other Christian leaders to claim the powers traditionally claimed by “witchdoctors” — that is, the power to name certain people as witches, and the power to combat their witchcraft. Naturally there are many issues here that merit consideration. But in this post my primary concern is to help us start a conversation about the meanings we have for the words we use. My own inclination, both because it best fits the empirical realities cross-culturally, and because of historical and anthropological precedent, is to reserve the term “witch” and “sorcerer/sorceress” for persons accused of being the cause of someone else’s misfortune or death. Because there are many cultures that have magico-religious practices that no one in the culture thinks has anything to do with harming others, I do not think it is helpful to expand the term witchcraft to include all magico-religious practices that are not Christian. I prefer to retain other terms (such as magic, or magico-religious) to describe these other practices. But it is also important to understand how people in given settings are actually using words. And in many contemporary settings (as among Ghanaian Pentecostals) the word “witch” or “witchcraft” involves a broadened range of meaning inclusive of many magico-religious practices not originally conceptualized as involving harm to anyone. By contrast, among Wiccans and Neopagans, the term “witch” is thought to describe a person with feminist, ecological, and life-affirming magico-religious values and practices grounded in an ethic of not harming anyone. 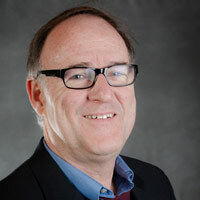 So, when having a conversation with any specific group of people, it will be important to accurately understand and adjust to their usage of vocabulary and what that vocabulary means to them — even where I do not believe their vocabulary is particularly helpful analytically for understanding realities cross-culturally. As we continue this conversation we will want to constantly reflect on the meaning of terms sometimes translated as “witch/witchcraft” or “witchdoctor” — whether those terms are in Swahili, Ewe, Kamba, French, Portuguese, Spanish, Hebrew, or Greek. In my next post on this topic I will invite us to consider various biblical passages and terms (such as kashaph ormagos) and the diverse ways in which these have been translated not only into Latin or English, but into Korean, Mandarin, Swahili, Sukuma, Ewe, Yoruba, or Kamba. In the mean time, why not purchase and begin reading your own copy of Opoku Onyinah’s (2012) book, Pentecostal Exorcism: Witchcraft and Demonology in Ghana?